Step back in time with me: It’s December 1994, Boyz II Men is crooning “I’ll Make Love to You” on the radio, Prodigy opens up the Internet to users of its online service, and a guy with a giant love for Disney decides it would be fun to create a web page. 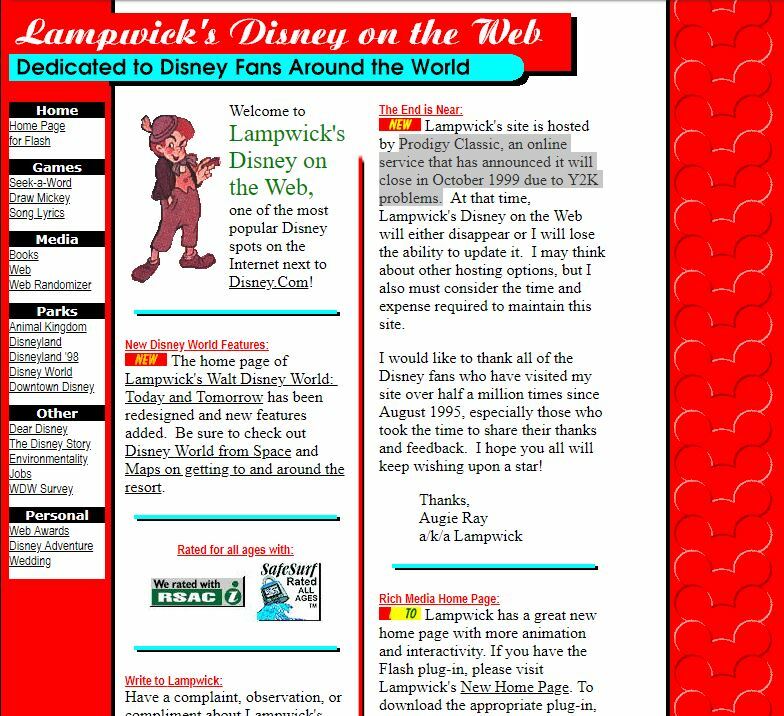 I launched a single-page wesbite called Lampwick’s Guide to Disney on the Web, never expecting doing so would turn into a five-year life-changing journey leading to a voluminous Disney fan site, a free trip to Disney World, and a new career in the nascent field of Internet marketing. I’d like to share three lessons that I learned from my experience as a Disney influencer and advocate. When I launched my Disney fan site, I didn’t do it to become an “influencer” (a term no one used yet), but I did wish to become an “advocate” (in the original sense of the word—helping others—not in the way we think of it today in a world of billions of interconnected people who, some seem to think, exist to help brands raise awareness.) I wanted to share my love of Disney and help others to have their own great Disney experience. And therein was my first lesson about influencers and advocates—the best ones do it to help others, not to become famous or get free stuff. Today, the “influencer” concept is such a part of our Internet-saturated culture that teens with a few dozen followers declare themselves influencers on Instagram, and it can seem there are more influencers on LinkedIn than there are influencees. While it might have been easy in the late 90s to spot early-adopting influencers on the embryonic World Wide Web or in Usenet groups, it is far more difficult in the era of purchased followers and #fakenews. That means the burden is on brands to use the tools at their disposal to find not just the loudest voices but the most authentic ones. Marketers have come to understand the largest followership does not necessarily mean the greatest influence, but recognizing the intent of influencer candidates requires more than just counting followers and looking for keywords. As my Disney site grew, so did my visibility and influence. My site was included in Luckman’s World Wide Web Yellow Pages, an actual printed book of websites. (There was a time before search engines, you know!) And as my visibility grew, so did my interactions with the Disney Company. Some of those experiences were quite exciting—like getting an early sneak peek at the plans for the Animal Kingdom park. But other exchanges with the company were frankly alarming. A Disney lawyer contacted me to accuse me of stealing IP (and was bemused to learn I was on his company’s PR mailing list). And one Disney “webmaster” (remember those?) reached out to inform me that the Walt Disney Company exerted copyright on any photos taken inside their resorts and, by the way, my site had hundreds of photos I’d snapped inside Disney World. He didn’t want me to take down my site—he just wanted me to understand my place. As a Disney fan and very active advocate, I found the discussion distressing, and it caused me to question my effort to maintain and grow my fan site. This was the second lesson I learned about managing influencers and advocates: Brands need to have a cohesive and coordinated effort to foster these valuable relationships. I understood that fan sites and online advocates were a new phenomenon and that every large brand was feeling its way through the brave new Internet world before 2000, so the inconsistent interactions were not unexpected. But today, there’s no excuse for having an uncoordinated or intermittent approach to advocates and influencers. Maintaining these relationships is not cyclical like campaigns but takes commitment and organization. Advocates are always advocating and influencers are always influencing, so your brand needs to have a constant, multi-prong approach to finding, engaging, feeding, listening and responding to them. 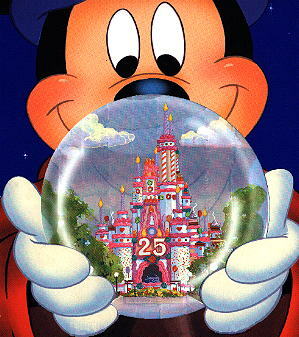 The cover of our invitation to Disney World’s 25th anniversary celebration. While I was simply happy to be a Disney advocate and gain access to a bit of inside information for use on my website, the real surprise of this experience was when my wife and I were invited to attend a Disney Super Fan event to mark the 25th anniversary of the Walt Disney World resort. I was nominated to attend by a PR executive who told me not to get my hopes up since there was still debate inside the organization about whether the burgeoning number of fan sites (many of highly variable quality) were a good thing for Disney or a threat to the control of their brand. The decision fell my way, and my wife and I had the time of our lives. Of course, being an advocate meant I wasn’t simply attending the event—I was covering it. With a borrowed and achingly slow 486 laptop and an expensive suitcase-sized digital camera that snapped fuzzy 1024-by-768-pixel images, I shared my experiences with my web readers. I live-blogged before there was such a thing, uploading hand-coded pages through a dial-up line at the end of each day at the event. And that was my third lesson learned about advocates (and, to a lesser extent, influencers): The ones worth their salt don’t need and should not want cash—they crave information, access, and experiences. One of my former financial services clients was paying to get attention on influencers’ blogs and social accounts, but they were having difficulty evaluating the benefits. The company shifted away from paid strategies and instead launched an engagement program, including an in-person annual event for select influencers, and found the benefits were much easier to evaluate. From an increased share of voice to greater inbound traffic to insights gained by listening, my client found that influencers engaged with content and experiences delivered better results. Alas, my Disney site met its demise when Prodigy Classic announced it would close in October 1999 due to Y2K problems. I could have considered moving the site to another host, but the tools were much cruder and the hosting more expensive then than it is today. Besides, this hobby had since become a career—I left the nice, safe, insurance company at which I worked to become an Internet Strategist at this brand new thing called a digital agency. 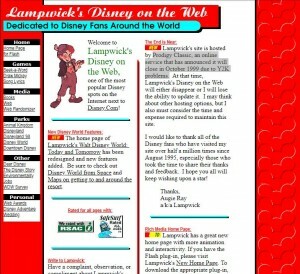 Today, Lampwick’s Disney site is nothing but a forgotten node on Archive.org. I still love the Disney brand, but today I’m a loyalist, not an advocate or influencer. Nevertheless, the lessons I learned stayed with me. I’ve applied what I learned from Disney on my jobs, and today my peers and I at Gartner use our experience across a variety of employers and agencies to help clients with their social media strategies. I miss my days as a Disney influencer, and perhaps that’s the fourth and final lesson—treat your advocates right, and they’ll still love you, buy from you, and encourage others to do so even decades later. I lived and died by your site! I’m so glad someone remembers it. It feels like a million years ago, now!